From June 2005 to August 2006, Gorsuch served as the principal deputy to the associate attorney general under former President George W. Bush. Last week, the department turned over to the Judiciary Committee roughly 150,000 pages of documents related to Gorsuch’s tenure there—and as the New York Times reported Wednesday, they show Gorsuch was “at the center of both litigation and negotiations with Congress” over issues including detainee abuses, military commissions, warrantless surveillance, and the Bush administration’s broad claims of executive power. Read some examples here. “References to those efforts may offer clues to Judge Gorsuch’s approach to the sort of national-security and executive power issues that rarely come before his appeals court but can be crucial at the Supreme Court,” wrote Times reporter Charlie Savage. During the negotiations with Congress over the Detainee Treatment Act, Judge Gorsuch helped persuade lawmakers to weaken a provision that permitted a civilian appeals court to review decisions by military tribunals. The original draft let judges scrutinize whether a tribunal had “applied the correct standards,” but the revised one only let them look to see whether the tribunal had applied standards set by the Pentagon. “When Judge Gorsuch was working for the administration, at least based on the initial things I’ve looked at, he appears to be a cheerleader for President Bush’s views on executive powers,” Leahy added, declining to specify which documents he had seen. “Documents produced by the Justice Department demonstrate you had a leading role in litigation and strategy over executive power and national security matters that have not yet been identified to the committee,” she said in a letter on Tuesday, giving the nominee a deadline of 5:00pm on Thursday to respond. Public interest group People for the American Way added its voice to the call. 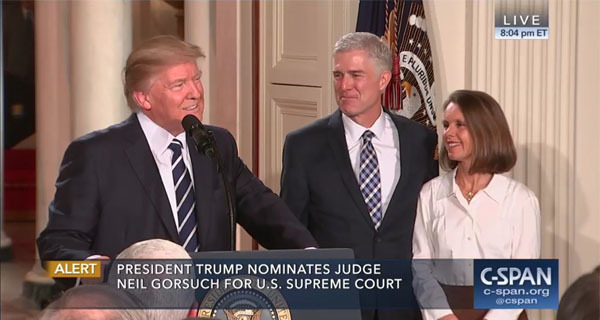 “The information we’re learning about Neil Gorsuch’s time at the Department of Justice only underscores how deeply concerned Americans should be that this nominee won’t be a meaningful check on Donald Trump’s illegal and unconstitutional agenda,” said the group’s vice president, Marge Baker. “Neil Gorsuch played a key role in defending the torture and detention policies that have been rejected by the courts and by our country. Now Donald Trump is promising to reinstate torture programs and enact anti-Muslim policies that directly contradict our First Amendment freedoms. And he wants Neil Gorsuch to help him do it. The nonpartisan watchdog group Fix the Courts has also filed a lawsuit in federal court after the DOJ failed to respond to its Freedom of Information Act request for Gorsuch’s records. Gorsuch’s confirmation hearing begins Monday.